If you really want "hands-on" info, the FOTM Lab Manual is also available from Delmar (ISBN:1418028754, Price: $19.95) with tons of hands on exercises. 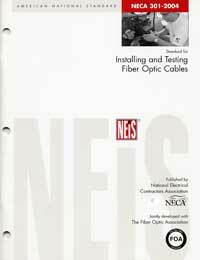 Intended as a manual for teaching labs, it has step-by-step instructions on cable preparation, termination, testing and troubleshooting. 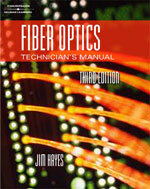 A must for classes, it's also a great reference for any fiber optic user. Remember the CFOT Test will use the new edition, along with the new NECA/FOA-301 Installation Standard. The FOA held its fourth summer Train-The-Trainer seminar in Cincinnati this past July, then held two classes for IBEW JATC Apprenticeship Instructors at the NJATC National Training Institute. 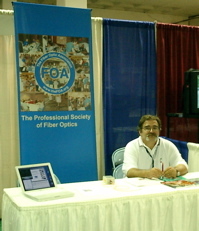 Here you see Tom Collins, who conducted the Cincy TTT course and a hands-on course at NTI, at the FOA booth during the NIT trade show. Jim Hayes taught two weeklong TTT sessions where he had 20 JATC instructors (below) learning the tricks-of-the-trade in teaching fiber optics. A new PowerPoint presentation in Spanish for instructors and anyone else interested has been posted on the FOA website for downloading. It is an explanation of fiber optics in Spanish, created by Francisco Castro Cabrera of Mexico City, who is starting up our new FOA chapter in Mexico. It is complementary to our PowerPoint introduction to fiber optics in English. Here is more information on the presentation in Spanish. The FOA will exhibit at the NECA Show in New Orleans September 18-21 and give a technical presentation our new NECA/FOA installation standard. We will also be at the 2005 FTTH Council's Conference & Expo October 3-5 at the Mandalay Bay Resort in Las Vegas, NV, where we may be ready to discuss a new FOA FTTH certification program. The LC connector has become the de facto standard for high speed fiber optic links, but until now, installers were limited to adhesive (epoxy or anaerobic) or prepolished/splice versions. 3M is now offering a Hot Melt version of the LC, which of course, offers all the advantages of a Hot Melt connector (fast termination, high performance and the "second chance" where you can reheat it and try polishing again if you just pull the fiber back a couple of mm before the adhesive cools and sets.) More information is available from 3M website (www.3Mhotmelt.com/introducing) or 800-426-8688. PS: note how much this duplex version - actually 2 coupled simplex connectors - looks like the FOA proposal for a standard connector! Packaging fiber like UTP in a box should saves time and money on installation and testing. Graybar and Berk-Tek have joined together to launch Fiber-in-a-Box, a fiber optic cable solution designed to help contractors save time and money. Fiber-in-a-Box is a tight-buffered fiber optic cable for Plenum or Riser environments. Each box includes 1,000 feet of 6 fiber or 12 fiber multimode Plenum rated (OFNP) distribution cable (62.5/125 micron) and features Berk-Tek's adjustable EZ-BrakeTM system with anti-backlash control. Ideal for horizontal, backbone or centralized optical cabling installations, the all-dielectric cable construction has 900 micron buffered fibers surrounded by aramid yarns and jacketed with next-generation lead-free polymer compound. Contractors gain savings from the innovative packaging featuring countdown sequential foot markings every two feet to ensure cable length accuracy and minimize waste. (That's also a neater way to find out fiber length than expensive OTDR or OLTS testing!) The compact, stackable cartons protect the cable from damage that can occur during traditional pull and cut procedures. Since the packaging eliminates this kind of handling damage, the factory guarantees the cable, and pre-installation testing is unnecessary. Fiber-in-a-Box is available exclusively at Graybar, a leading North American distributor of high-quality components, equipment and materials for the electrical and telecommunications industries. For a limited time while supplies last, purchases qualify for a $50 rebate on 12 fiber cables and a $25 rebate on 6 fiber cables. ADC is currently seeking a Product Specialist for fiber optic cable and related ancillary products to support the sale of leading edge fiber optic cables in a wide array of applications. Position is located in Vermont. Responsibilities include support of the Product Manager- Fiber Optic Cable, in the definition, direction, profitability, and market share goals of the products over its entire life cycle. The Product Specialist will assist in the preparation and implementation of the annual budget. The Product Specialist also plays a key role as a member of the product development team through the establishment of the product road map, development of product requirements, management of changes to the requirements and the establishment of development and customer support project priorities. In addition, the Product Specialist will be responsible for assisting with training of ADC sales and external customers on the fiber cable products offered by ADC. The Product Specialist will be expected to exercise good judgment by operating within broadly defined guidelines to complete tasks consistent with obtaining product line results and support of the day-to-day operations of the business. ADC is a world leader in providing global network infrastructure products, services and software that enable the profitable delivery of high-speed Internet, data, video, and voice services over our customers' unique networks. ADC (NASDAQ:ADCT) has sales into more than 90 countries. Diamond USA is looking for a Mobile Fiber Optic Service Manager. Are you looking for a challenge in the Fiber Optic and Premises Network Markets? Do you have what it takes to be an entrepreneur within a company? Are you a "hands -on" type of person in the field? Diamond USA is looking for a candidate that has proven field fiber optic technician experience, strong industry knowledge, excellent customer interaction skills, the ability to manage multiple jobs and assignments and train employees and customers. The position will include field support of installers and designers, certification of installers, diagnostic and restoration of fiber optic data networks, and provide field and market expertise to sales team. RCDD is a plus. Pre-employment drug screening and MVR required. We offer competitive salary with benefits, 401K. What's a substitute for index matching fluid in mechanical splices? Tech Puzzler: We've used mineral oil and vaseline from the local drugstore. Alcohol can be used also, but it evaporates rapidly, making it only good for temporary use in testing.